The Fujifilm Instax Mini 9 is one of the most popular instant cameras ever. Available in a range of colors, this is a great camera for parties - or to relive analog film photography. Our price comparison tool has scanned the websites of all the major retailers, so you can be sure that you’re getting the best Fujifilm instax Mini 9 prices available anywhere, right now. Read on for today’s best camera deals. And, if you are interested, these types of cameras are also featured in our best cameras for kids guide. In an age where photography is 99% digital, it’s perhaps surprising that analog photography has begun a comeback in recent years, with Fujifilm’s range of Polaroid-inspired ‘instax’ instant cameras being the most prominent members. The Fujifilm instax Mini 9 is at the cheap and cheerful end of what’s available. Yet its lack of sophistication is hardly a stumbling block when what we want are quick and easy instant, credit-card-sized (62x64mm) prints to amuse the kids – often taken by the kids themselves. Packs of Fujifilm Instax film have ten exposures and come with a variety of colored borders or frames – and there is a black-and-white version too. 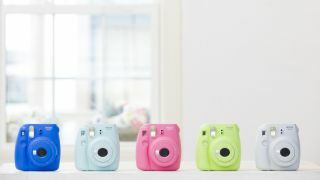 The Fujifilm instax Mini 9 comes in a choice of five colors, namely Cobalt Blue, Ice Blue, Flamingo Pink, Lime Green and Smoky White. It's slightly bulky compared to the digital alternative, as it has to fit both a printer and image capture mechanism within its still-lightweight chassis, but here simplicity is key – and that’s what you’ll be buying it for. Great fun at parties and family gatherings, the mirror on the front – handily positioned close to the lens – makes it simple to get an instant selfie, or group portraits with the photographer included. The camera is activated via a convenient button located by the lens, with the camera’s dial adjusted to illuminate one of the chosen shooting modes, while the exposure selection here includes icons for cloudy and sunny days, along with an interior/nighttime setting and even a high-key option, described as providing the ability to take pictures with a softer look. Specification-wise, the lens is an unflashy 60mm, with close-up shooting of up to 35cm away from the subject possible, and there are three focusing modes to choose from: macro, normal and landscape. You also get a built-in flash with a range of 0.6-2.7m, and everything is powered by two AA batteries. Scroll down for more of today's best Fujifilm instax Mini 9 deals.